No other food is more emblematic of Sardinia than bottarga di muggine, the cured roe of grey mullets that thrive in this island’s lagoons. The primary zones of production are the gulfs of Cagliari, the island’s capitol, and Oristano, located near Cabras, the city reputed to produce Sardinia’s finest bottarga. The method of preservation is centuries old, and though its name derives from the Arabic word batârikh, which translates loosely to “dried,” bottarga’s history dates back even farther. Egyptian murals dating from the 10th century BC depict fisherman executing the lengthy process in which bottarghe were, and still are made. The mullet’s egg sacs are carefully removed and salted for up to one week to promote dehydration. They are then washed and sandwiched between weighted, wooden boards to press out any residual liquid, and to give them a solid, flat shape. Finally, they are hung and allowed to air dry until they take on their characteristic coral color. They are then packaged in hermetically sealed plastic bags (originally, they were encased in beeswax). The technique, also used by fisherman at the port of Alexandria, spread throughout the Mediterranean to countries such as Italy, France, Turkey, Greece and North Africa—today bottarga is also produced in Japan, Australia and Israel. Like so many wonderful foods created not for luxury, but to inhibit spoilage (before the invention of the refrigerator), bottarga is considered a delicacy, and is often referred to as “Sardinian caviar,” and like caviar bottarga carries a lofty price tag, costing about $10.00 an ounce. Roberto Portoghese, a third generation bottarga maker, produces some of Cagliari’s best bottarga and exports his “Sardinian caviar” worldwide. On a recent visit to his azienda (the site where the bottarghe are produced), he explained that current laws regarding strict sanitation practices have changed the conditions where bottarghe are made. He now uses special equipment designed to control temperature and humidity levels that curtail bacteria. He proudly assured me, however, that all of the preparation is still carefully done by hand, as its been done for hundreds of years. Visually, bottarga can leave you daunted—it resembles an orange-colored amoeba. But its taste is a wonderful evocation of sea and land, being both delicately briny and nutty in flavor, with a slightly pleasant bitter finish. Sardinians eat bottarga thinly sliced on top of raw vegetables such as celery or artichoke hearts simply dressed with extra-virgin olive oil and a squeeze of lemon (I also love to pair it with fennel). Or more commonly, grated and tossed onto malloreddus, a small quill-shaped pasta with ridges, served with a simple sauce of garlic infused olive oil; allowing the complex flavors of this ancient food to shine through. Malloreddus is the classic Sardinian pasta also known as gnocchetti Sardi. If you have trouble finding them, this dish can also be made penne, or with spaghetti. 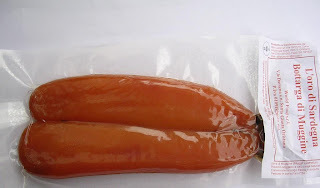 Bottarga should be taken out of its vacuum sealed package at least an hour before it’s eaten (the airtight container dulls its flavor). Left over pieces should be wrapped well in plastic wrap, and kept in the refrigerator. It will keep for months, but its flavor may change if it becomes too dry. Pre-grated bottarga sold in jars is a mediocre substitute to the whole roe; it’s typically either flat or assertively fishy in flavor. Using a paring knife, carefully remove the paper-like skin from the bottarga. Using a fine grater, grate the bottarga into a bowl and set aside. In a small saucepan add the olive oil and crushed garlic cloves. Cook the garlic over a low flame until they turn golden in color. Turn of the flame and remove the garlic from the pan (add the chilli pepper if choose to use it). Bring a large pot of salted water to a rapid boil and cook pasta according to directions. When nearly done take one-half cup of the pasta water from the pot and reserve (which will give a creamy texture to the finished dish). When the pasta is done, turn off the flame, drain and return to the pot. Add warm oil, the 1/2 cup of reserved pasta water and the bottarga; stir well and serve.